"We live surrounded by networks: social networks, the wireless and cellular networks that make our magical phones possible, infrastructure networks of power lines and traffic, and of course the old-fashioned networks of friendship and influence." continues Madison.com. 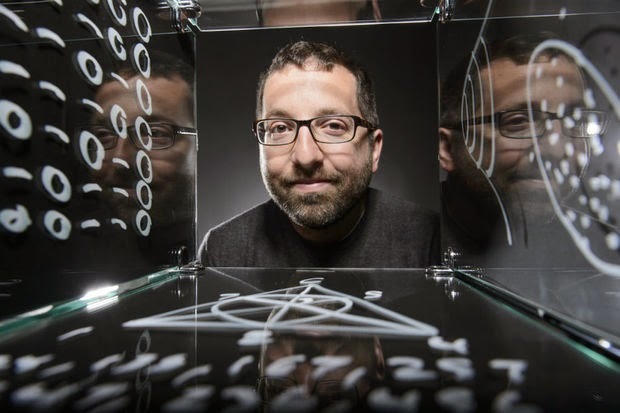 Jordan Ellenberg, professor of mathematics at UW-Madison, is pictured in an editorial studio portrait. How do we know what’s happening in a network, which we might have only partial knowledge about, and which might have millions or billions of moving parts? Suppose you’re the CIA, and you have access to a huge database of cellphone contacts, and you want to identify a small group of “subjects of interest” who contacted each other more than you might expect. Or suppose you’re Facebook, and you want to make good guesses about which pairs of people are actually friends but haven’t yet revealed that fact to Facebook. To a mathematician, those two problems are actually the same: finding “communities” of tight connections in a massive network. I’ve been studying these problems at the Wisconsin Institute for Discovery, a new interdisciplinary institute at UW-Madison where researchers in math, electrical engineering, computer science, statistics and economics get together to talk about the new math we’re going to have to create in order to understand the new universe of information we’re now encountering. Yes, there’s such a thing as new math! The way we teach things in school, you’d think mathematics stopped growing around the time of Isaac Newton. In reality, new circumstances require new mathematical tools; and circumstances are changing fast. There’s more math being made in the United States in the 21st century – in public and private universities, in federally funded institutes and in corporate labs like Microsoft Research — than at any time or place in the rest of human history.